Your Chapter Needs a Website? The DKG News for January/February is here! Some state organization bylaws do not have a provision for automatically updating the SO bylaws and standing rules to bring them into conformity with the DKG Constitution and International Standing Rules. Therefore, at their state conventions members go through the tedious process of proposing and voting on each conforming amendment separately. Here is a way to streamline the process of making all of the amendments necessary to bring the state organization’s governing documents into compliance with the Constitution and International Standing Rules. If the convention adopts an amendment to the state organization’s bylaws that states, "Changes in the Bylaws and Standing Rules of __(insert your SO name here)___ necessitated by amendments to the DKG Constitution and/or International Standing Rules shall be made by the __(insert the name of the authorized board or committee here)___ and then reported to members ___(indicate how, when and where___, " the state organization will not have to approve each change individually. Note that the amendment needs to state who has the authority to make the conforming amendments and to indicate when and how members are to be informed of the changes. If such an amendment is proposed and adopted at a 2019 SO convention, it will take effect immediately. Therefore, if it is adopted before any conforming amendments are proposed, the members will not have to consider those conforming amendments. They can simply be made by the authorized board or committee and reported to the members in the prescribed manner. The Constitution states: "Each state organization of the Society shall be designated by a geographic area or by a country name. Each chapter shall be named by the state organization." ​Robert's states: "If the bylaws authorize certain things specifically, other things of the same class are thereby prohibited" [RONR (11th ed. ), p. 589, ll. 33-34]. This means that if the DKG Constitution specifically authorizes a geographic area name, any other name such as a Greek letter name is prohibited. Also, if the Constitution specifically authorizes each state organization to name its chapters, the state organization is prohibited from naming other things of the same class, such as its own state organization. In addition, at the 2018 convention the members amended Article I, Section B of the Constitution by striking the Greek letter or combination of Greek letters by which the state organization was designated and inserting the geographic area by which it was to be designated. Since the members voted to strike the Greek letter or combination of Greek letters that designate a state organization's name, the Greek letter(s) must be struck from the designated name. You can, however, add the parenthetical phrase "(formerly known as __Greek letter(s)__ State)," since such a phrase does not suggest that "Greek Letter(s)" is a part of the official name. It merely provides historical information. What's going on in DKGNJ? If your chapter is planning to sell items at the convention, you need to get approval by January 15. Contact Candice Zachowski. You're late now, so call her quickly! You can place an "Ad" in the Convention booklet for $25. Honor your initiates, advertise you cousin's business. It's a bargain at twice the price. Are you coming to convention? Pay $50 if you are staying at the hotel, $60 if you are commuting. Are you coming to the luncheon? Add $37, unless you are an initiate or presenter ($0). Are you coming to the banquet? Add $49.50. Add up your amounts (Example: $50+$37+49.50=$135.50) and write your check or choose the correct option on the PayPal button. The registration form is not ready yet. Watch for it! The hotel costs are: $138.10 for a double, $150.10 for a 3 people, and $162.10 for 4 people. There are no cots! Room costs include taxes and breakfast with tip. The prices listed by the hotel do not include the taxes and tip, so they look lower. It’s that time again when we look towards a new biennium with new opportunities to lead and contribute to our organization. If you are currently serving on a committee at the state level or are interested in serving, please complete the attached form and return to me (wesrosee@verizon.net) by March 15, 2019. The US FORUM News for December 2018 is out. Find out about the Health Care Ruling, National Flood Insurance, and more. 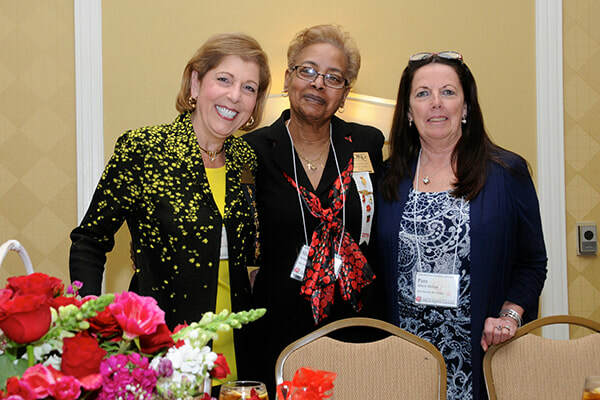 Maryann Woods-Murphy, Alpha Chapter, is on the front page of the DKG Society’s home page! Way to go, Maryann! Are you interested in the Arts? The DKG Society International has an online art gallery in which your work could be displayed. There are categories of Visual Art, Music, Writing and Video. Within each of these there are sub-categories. There is a place for just about anything you create! The next submission deadline is Arts & Humanities Submissions for Spring Gallery (open Jan. 15- Feb. 15) This gives you time to peruse the current gallery and get your work ready. Why be a volunteer for the 2020 International Convention in Philadelphia? Pennsylvania will be joining with New Jersey, Delaware, Maryland, and the District of Columbia to host the 2020 DKG International Convention in Philadelphia July 7-10 at the Downtown Marriott Hotel. We are in the volunteer commitment stage and we have six reasons for you to volunteer for this wonderful event. ​It’s Good For Your Health! No, we aren’t making this up. Studies have found that when you stop thinking about your own problems and focus on a project, your stress levels start to decrease, your immune system is strengthened and your overall sense of life satisfaction increases. This is because helping interrupts tension-producing patterns and replaces it with a sense of purpose, positive emotions, and high confidence levels. Give Back to DKG! Your reason for volunteering should begin where your passions lie. Let your love of DKG create a positive experience for those attending the 2020 Convention. Make Real Connections! Volunteering for the 2020 Convention will let you meet people from all the regions and state organizations of DKG. You could meet your new best friend, future business partner, or have a conversation that sparks a real change in your life. Gain a Whole New Perspective! Volunteering at the International level will change how you see DKG. This shift in perspective will open your mind to the scope of the Society. The Food! The convention hotel is attached by walkway to the Reading Terminal Market. Beloved by locals and tourists alike, this historic indoor market features more than 80 vendors offering an astonishing variety of food, with some vendors operating in much the same way that they did when the market opened in 1892.The globally inspired food — available for breakfast, lunch, dinner and dessert as well as for snacking — is the main draw, while butchers, bakers, chocolatiers, cheese mongers and produce vendors offer food, ingredients and goods for sale. From scrapple and samosas to soul food and smoothies, Reading Terminal Market is such a fantastic place to eat that it can be tough to choose what to get. New Jersey state organization has developed a Volunteer Response form that is available for you and your chapter members to complete on line. Responses will be added to a database for easy reference. Perhaps you have already completed a paper form that was obtained at the 2018 state convention. Please do additionally complete the Google Form at this link: goo.gl/gHKUQN This will assure that you are in the database for volunteering at the convention. July 5-12, 2020, the DKG International Convention is being hosted by the Middle Atlantic States of Pennsylvania, New Jersey, Delaware, District of Columbia, and Maryland. We need YOU to attend the convention AND to volunteer to help make it a success! Due to a technical glitch, any responses submitted for the 2020 Convention Survey, before 9/18/18, were not recorded. Please resubmit the survey so we have your response. It's up and running now. I am so excited about sharing this news with you! The AZS Executive Committee agreed to work in partnership with Delaware, Maryland, Pennsylvania, and Washington, D.C. to host the 2020 DKG International Convention. I am proud to be representing New Jersey as a member of the Steering Committee for this event. The committee visited 3 locations and venues. Nita Scott made the final decision for the location after listening to the committee's research. The convention will be held at the Marriott Downtown, Philadelphia, 1201 Market Street, Philadelphia. 2020 seems so far away but the planning has already begun and we need everyone's help. New Jersey has not been able to host a regional or international event so this is our chance to show support to our DKG international community. AZS is a fabulous group of dynamic women who all have something special to contribute to get the work done, individually, in groups or chapters, and at the state level. Below is the link to the Google Survey, 2020 DKG Convention Volunteer Form, created by our own Jessi Oliano, who answered the volunteer call enthusiastically. Thank you Jessi. PLEASE send this email to every chapter member NOW, via email or snail mail, and post it on your chapter website and social media places. PLEASE complete the attached short survey NOW, so we can begin our planning. It is very important that all AZS members receive this email. Thank you all so very much for contributing to the success of the 2020 DKG Convention. We need EVERYONE'S help. Congratulations to the two Professional Growth Stipend Winners who were selected by the Scholarship/Stipend Committee at the September 8, 2018 State meeting. There were four worthy applicants, and the decision was a difficult one. Thank you to the chapter representatives who participated. Robin Atkins and Jane Flanagan will each receive stipends of $500. Robin Atkins (Pi Chapter). Robin intends to use the stipend to present "A World Tour with Cinderella" program at children's libraries in the Gloucester County Library System. This program is directed at helping children feel welcomed and supported in an inclusive and diverse environment, helping them learn empathy and social skills to become global citizens. Jane Flanagan (Xi Chapter). Jane is a special education teacher. Her school district is implementing a program called Positive Behavioral Interventions and Supports. Along with this program, Jane will use mindfulness, meditation, flexible seating, and a calming area in her classroom. Jane will use the stipend to purchase special furniture for her students, so they will have comfortable and safe seating choices. Stipends will be granted to members of Delta Kappa Gamma New Jersey State working individually or as a team in the amount up to $1000.00. The next deadline is Dec. 15 for Stipends, the Elizabeth M. Bozearth Scholarship, and the Margaret Abel Scholarship. See details on all of these opportunities at https://www.dkgnj.org/available-scholarshipsstipends.html. There is an exhibit at the UN about "An Inch of Water." This is information about the fact that drowning is the second highest cause of death for children worldwide under the age of 14. A reminder to all members that No Child is Safe in the Water - they must be watched at all times. They can fall over in an inch of water and drown. Scary! Often they cannot right themselves and turn over or stand up. We're planning for the next CTAUN conference in March or April of 2019. Saturday at St. Pisagh Church AME 306 N. Warwick Road Lawnside. Viewing 9-11 and services at 11. No designated charity so people can give to a charity of their choice or flowers. Iota Chapter will be sending monies to one of our Charities in Sharon’s name. Please keep Thelma and Doretha in your prayers. ​Sharon was the Recording Secretary of Alpha Zeta State during the 2013-2015 biennium. The photograph above is from the luncheon at the 2015 convention. If a page is password protected, our DKG Founder will let you in. Vision: Leading women educators impacting education worldwide..